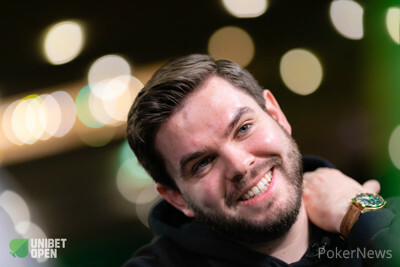 Paul Jux Holderness raised to 325,000 with the :::Ks:::Jd and Julien Kron called with :::Js:::8h. Both players flopped top pair on :::Jc:::7s:::5d and Kron checked, Jux Holderness bet 325,000 and the Frenchman called. On the :::Kc turn, Kron checked once more and Jux Holderness carefully cut out a bet of 675,000. Kron had around 2.8 million behind and moved all in, the snap-call followed and the Main Event champion was crowned even before the :::Jh on the river further improved Jux Holderness to a full house. Kron was eliminated in 2nd place for €46,550 and Jux Holderness became the latest Unibet Open champion. A recap of today’s action is to follow, as the festival at the Bonnington Hotel has all but wrapped up.